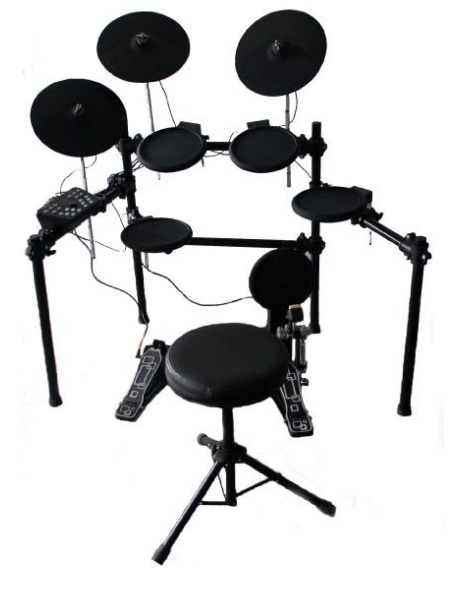 - Drum Pad:4 drum pads, 3 cymbal pads, 1 hi-hat control pedal, 1 kick trigger. - Drum kits:20 preset kits, 10 user kits. - Demo:20 demo for practise. - Controls:Power Switch, Start/Stop, Setup, Memory,Kit. - Drum Sound/Level/Pan/Tune, Demo/Volume, Drum Off, Click, Hi-Hat, Crash,Ride, Hi-Hat Control, Snare, Tom1, Tom2, Tom3, Kick, Rim, Volume+/-, Tempo+/-. - Connections: Midi Out/Phones/Port/Hi-Hat Control/Hi-Hat/Crash/Ride/Snare/Tom1/Tom2/Tom3/Kick/Output(R&L/Mono)/Line In.